Last night Stu and I went to see Alan Bennett's The Habit Of Art at Lyttelton Theatre on London's glitzy South Bank. 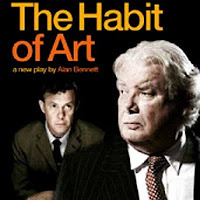 Starring Richard Griffiths and Alex Jennings the play centres on a fictional meeting between WH Auden and Benjamin Britten. The former is peeing into his washbasin, waiting for a rent boy to arrive in his college rooms and is stuck over his stanzas. The latter is sailing uncomfortably close to the wind with his new opera, Death In Venice. The play is a play within a play. Auden and Britten, along with their biographer Humphrey Carpenter, are depicted as characters in a play called "Caliban's Day". We see a rehearsal of this play, so Griffiths and Jennings are in fact playing the actors playing Auden and Britten as well as Auden and Britten themselves. The piece is full of ideas, some filthy laughs and great performances. We pretty much laughed throughout. But it is also deeply and unexpectedly moving. "In the end," said Auden, "art is small beer. The really serious things in life are earning one’s living and loving one’s neighbour."